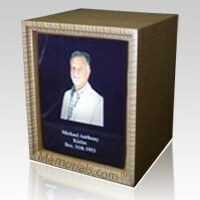 The Photo Maple Wood Cremation Urn is made of curly maple wood with a beautiful soft finish. The traditional design of the urn is elegantly accented with the beautiful full-color photo faceplate, which also holds the information of your loved one. This stunning urn will become a treasured family heirloom for many generations to come. "The Casket was here on the 2nd day. I was a little worried about how fast I would get it to the funeral home. Shipping was super fast and the casket was just great. I think 1/2 the price of the funeral home. The funeral home liked the casket too, but they wanted to sell me their casket of course. Thank you for making this possible for me."